For surfboards, sailboards and other applications where a water-clear coating is required. Vapors harmful. Keep out of reach of children. Fiberglass Hawaii's newly developed 3-minute room temperature curing epoxy system does not shrink, micro-crack or absorb water. 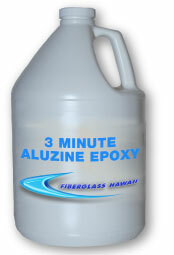 FGH Clear 3-Minute Epoxy resin is low viscosity and when mixed with Aluzine 2:1 Clear Fast Hardener displays exceptionally rapid cure over a broad temperature range. This enables the use of FGH 3-Minute Epoxy Resin in rapid set patching compounds capable of use in temperatures as low as 50 deg. F.
Use Fiberglass Hawaii Acetone for cleanup of tools and equipment. Wash hands thoroughly after use with soap and water only. 2 Parts FGH 3-Minute Epoxy and 1 Part Aluzine Fast hardener is specially formulated for its hardness, toughness and waterproof properties. Avoid breathing vapors and contact with skin, eyes, or clothing. Hands or other skin areas coming in contact with epoxy should be washed thoroughly with soap and water. Rubber gloves and eye protection should be worn when handling.